This elephant loves to prance around showing off her array of special flowers. Chevron designs for an adorable Pink and Gray Elephant Themed Baby Shower Decorations and Supplies. See our Personalized Pink and Grey Elephant Baby Shower Invites. You will have the most adorable and unique custom baby shower favors. Elephant themed baby shower for baby girls includes matching plates and napkins, cookies and cake pops, invitations and save the date including coordinating and matching postage stamps. We even created cute elephant gift wrapping paper, with coordinating ribbons. Use these to make elephant baby shower centerpiece for your table. Top your plain baby shower cake with these Cookies, Pops and or Cake Toppers for a unique yet super easy Elephant Baby Shower Cake Ideas. Oh so yummy, Chocolate Covered Oreo ® Cookies. Custom printed Elephant Baby Shower Cookies will delight your guests. Choose Milk Chocolate or White Chocolate. All of our Pink and Grey Elephant Decorations, Favors and Gifts are design to coordinate all together for an amazing Elephant Themed Baby Shower event. Cream Cheese Frosting in 3 Chocolate Icing Flavors, has an array of Drizzle Colors, along with 3 choices of Deliciously Moist Cake flavors. Veronica’s Treats say they are “Extra, Extra Delicious and Insanely Moist“. Impress your guest with incredibly delicious and extra special, because you have a popular and cute pink and grey elephant baby shower theme, with a precious adorable cute baby elephant. Your guest will be amazed at how you found someone to create these Customizable and Personalized supplies. Be sure to give us a CALL if you would like any CHANGES, ADDITIONS, DELETIONS, TEXT or designs elements. No extra charge for custom orders. CALL 239-949-9090 and ask for BEV. By decorating it with these cute Elephant Fondant Cake Decorations: Step by Step Instructions to form an Elephant using fondant. For a really easy Elephant Baby Shower Cake, just place the elephant cake pops or cookies on top of the elephant cake. I would start with placing cookies or cake pop on top of your cake, along the perimeter. Add one cookie or elephant cake pop in the center of the cake. If you would like to offer more cookies and pops, place them on a large plate around the cake or on a separate plate. Cute and delicious. What could be better. You can take any plain cake and create a cute elephant baby shower cake by adding this cute elephant. Make it gray or pink similar to our baby elephant baby shower decorations colors. What if you just want to make a clay elephant for a really cute centerpiece. I would think you could follow the same instuctions on this How to Make an Elephant Cake Topper video. We also created some cute elephant cake toppers for you. An array of cute baby elephant baby shower supplies, decorations, favors and gifts await you. We can change every design to fit your needs. Colors, text size and style, add or remove design elements, etc. Every design can be placed on every product. 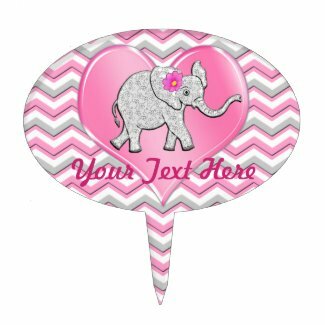 We can create wonderful baby elephant invitations, favors, save the date baby shower cards and more. If you prefer not to have the elephant, we can create unique baby shower supplies, decorations, invite, etc in your color pallet. No added charges for customized special orders. Call us to create any Zazzle gift or accessories.